Windermere is England’s largest lake and the most famous. It is 17km long and about 1km wide and contains about 314 million cubic meters (69,000 million gallons) of water. The catchment in which it sits is 230.5 square km in extent and contains a number of significant still waters and many rivers and streams. To the north of Windermere lie Grasmere and Rydal with Loughrigg tarn and Elterwater to the north west. Blelham Tarn and Esthwaite Water are located to the west and several other small tarns occur within the catchment. The main inflows into Windermere are Rivers Brathay and Rothay at the north end of the lake, Trout Beck draining the north east side of the catchment and Cunsey Beck which drains the Esthwaite sub- catchment. The main outflow from the catchment into Morecambe Bay is the River Leven. 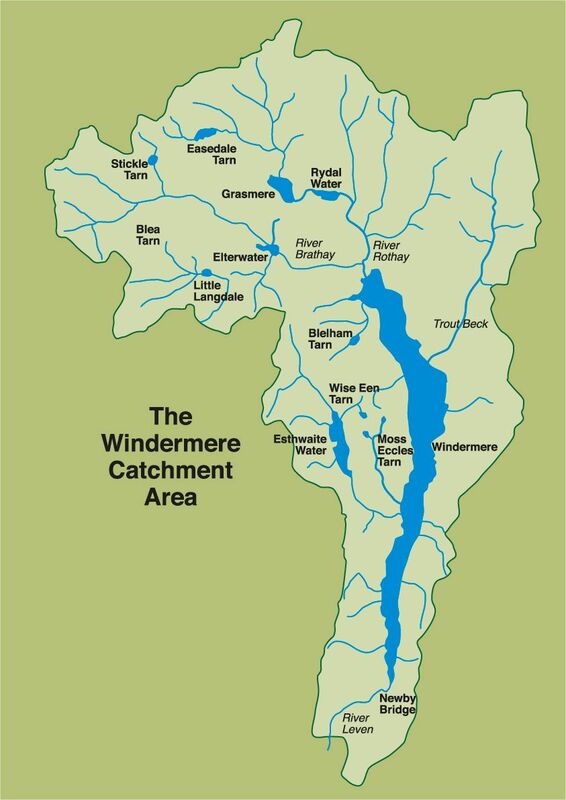 The surface of Windermere is 40m (130ft) above sea level therefore the bottom of the deeper north basin (with a maximum depth of 64m) is well below sea level. The north basin is separated from the shallower south basin (maximum depth of 42m) by an area of relatively shallow water (average depth 10m) in the centre of the long axis of the lake where Belle Isle and other islands are located. The ferry crosses the lake at this narrow point between Ferry Nab on east side and Ferry Landing on the west side and this is where the FBA has been situated since 1950 (previously the FBA was housed in Wray Castle which now belongs to the National Trust). The two basins function, in many ways, as separate lakes and have differences in water chemistry, water quality, fish populations and other aspects of their biology. Freshwater Biological Association. Registered Charity No.214440. A Company Limited by Guarantee Registered No.263162, England, UK.